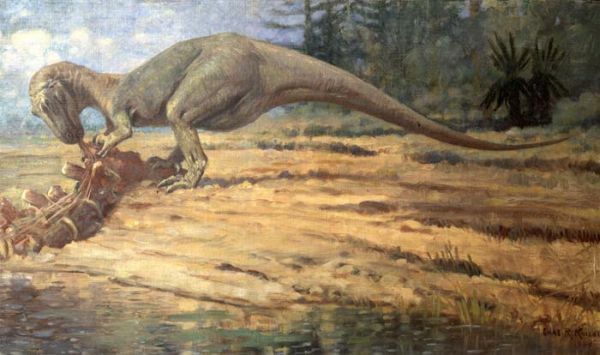 Of all the dinosaur types, the theropods are the ones that seem to exert the greatest fascination, perhaps because of their beauty and grace, and the coolness factor inherent in being the largest and most formidable terrestrial preditors the Earth has seen, perhaps due to the fact that even some "smaller" (by dinosaurian standards, by mammalian standards these were still large preditors) ones like Deinonychus seemed to be equipped with weaponry out of all proportion to their size, perhaps because more than any other group of prehistoric animals they constuitute a splendid illustration of evolution and transitional forms, constituting a series that began with dinosaurs and culminated in birds, and that, therefore, they are, phylogenetically speaking, the only "dinosaurs" to have survived the end Cretaceous extinction, and not only survived but flourished. There are books, websites, and blogs devoted solely to theropods (among books, none has been able to top Greg Paul's now sadly out of date Predatory Dinosaurs of the World, a book that inspired a generation of paleo geeks with its combination of great readability and beautiful illustrations). It is only proper therefore that we at Palaeos likewise devote a number of pages to these spectacular creatures.